On the April 13th edition of The Brian Lehrer Show on WNYC, Lehrer opened his “Ask The Mayor” segment by describing PS 321, in Mayor de Blasio’s Park Slope neighborhood, as the “epicenter” of the city’s Opt Out movement. The co-chairs of PS 321’s Testing Task Force (parents and teachers) respond here. You can listen to the segment on WNYC or read the transcript at the bottom of this page. The PS 321 Testing Task Force is a parent-led group that works in partnership with teachers and school leadership to educate our community about the effects of NYS and NYC testing policies and to advocate for meaningful, developmentally appropriate, educator-developed student assessments. Since our school was invoked during the Meet the Mayor segment on WNYC’s The Brian Lehrer Show last week, we would like to respond to both Brian’s question and to the mayor’s response, which aired unchallenged. What’s going on in our neighborhood, you ask? What’s happening in Park Slope in terms of opt out is actually not as anomalous as you suggest - the past few years have seen significant test refusal numbers at schools in East New York, Harlem, the Bronx, Red Hook, Brownsville, and Washington Heights. The implication that opting out is limited to “Brownstone Brooklyn,” is mistaken. What’s happening in Park Slope in terms of opt out is actually not so different from what’s happening in neighborhoods across the city, from Brownsville to the Bronx. The past few years have seen significant test refusal numbers at schools in East New York, Harlem, the Bronx, Red Hook, Brownsville, and Washington Heights. The implication that opting out is limited to “Brownstone Brooklyn,” is mistaken. What is also happening across the city is that parents are seeing how continued emphasis on state test scores ultimately has a disproportionate effect on school closures in poor neighborhoods; how the use of test scores perpetuates segregation in our city, both when parents are deciding where to rent or buy, and when they’re making choices around Elementary, Middle, and High School; and how it narrows the curriculum most acutely at schools in poor neighborhoods. There’s a stark difference between the city’s overall opt out numbers and the state’s, and it’s certainly true that parents at some schools in wealthier neighborhoods, whose schools can count on high test scores (as they are largely correlated with socioeconomic status), may have more time, a bigger platform to speak up, and, above all, more access to accurate information about the tests, their impacts and the right to refuse them. 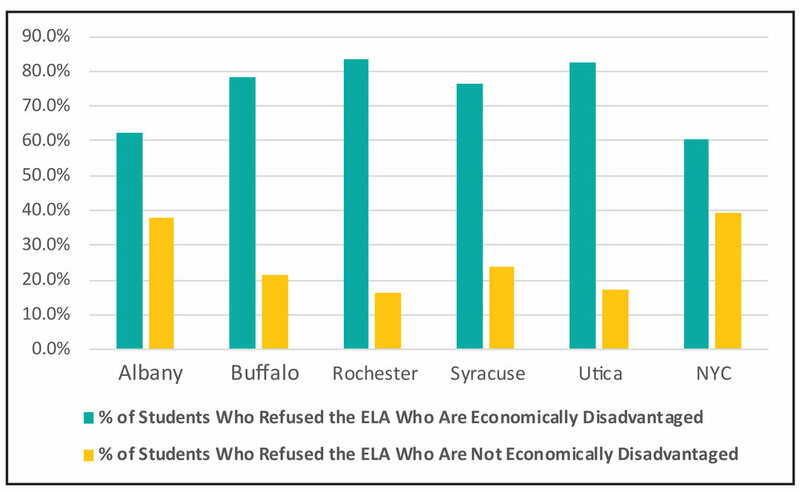 Under an administration that touts the catch phrase “Equity and Excellence for All”, it’s dispiriting that access to facts about the tests and their impacts is very much a tale of two cities. Mayor de Blasio has failed to comply with a 2015 unanimous city council resolution calling on the NYC DOE to inform all parents of their rights regarding test refusal at the beginning of each school year and in fact this spring the NYC DOE removed language from guidance instructing schools to respect parents’ right to opt out until faced by questions from the City Council Education Committee. NYC teachers have been warned against sharing their professional analyses of the educational appropriateness of state tests and former Chancellor Farina told parents at a private meeting in District 15 that she herself would in fact opt out in certain cases yet declined to share this with all NYC parents, despite D15 parents’ strong urging that she do so. Because NYC schools risk receivership and even closure based on test scores, because state test scores are the variable used in awarding free SHSAT preparation, because the city publishes school-wide score averages in its own guidance materials for parents and because NYC School Reports literally center their definition of “great schools” on student test scores, test prep continues to feature prominently in city public school curriculum, beginning as early as kindergarten, no matter how much the mayor publicly claims to “de-emphasize” it. Test prep is very much part of the culture of NYC public schools, and if the mayor is truly unaware of this, he is startlingly out of touch with the reality on the ground the city’s schools. Test prep, along with access to accurate information, is another area in which the disparities and inequity amongst schools is breathtaking. Our school, PS 321, “limits” test prep to one period a day for the two weeks prior to the NYS ELA and math tests, respectively. However, many schools within a stone’s throw of PS 321 host early morning test prep and “Saturday Academy”, and in some neighborhoods in NYC test prep comprises the crux of the school year until April, with even field trips relegated until the two months after state tests are completed. We recognize and agree with the mayor that there have been some changes to the state tests and how they’re used. The momentum for many of those changes is directly attributable to the persistent efforts of the state’s sizeable Opt Out movement. And although there are a handful of parent-led groups working hard in the state, what strikes us about the “movement” is that it has taken hold everywhere, in bigger, county and district-wide groups, but also in small, school-centered groups like ours, and among individual parents across the city and state. We urge WNYC, the mayor, and the Chancellor to look beyond the myths and engage with parents and educators directly. BL: And I’ll begin with some things that are in the news this week, beginning with your new Schools Chancellor, Richard Carranza, urging parents not to opt their kids out of statewide standardized tests... Is that consistent with your own views as a critic of high stakes standardized testing? MAYOR: Yes, and I’ll tell you why. And I really do understand deeply why parents who, during the previous approach in this city and in the state just a few years ago were profoundly frustrated with an overreliance on high stakes testing. Remember, 5 years ago, this city was devoted, under the Bloomberg administration, to a high stakes testing-based approach to education; the state was, too much, as well. A lot has changed, and this is what I really want to emphasize to my fellow parents. Since we came in, we've greatly reduced the focus on testing. Testing is not used in the quote-unquote “grading” of schools, which I think was one of the most idiotic approaches in the previous administration towards education. We don’t grade schools anymore based on high stakes testing, we have changed the admissions structure, we have changed, and the state has changed, the evaluation of teachers, students are given more time on tests. There’s a host of changes that have reduced the undue pressure; there’s been an absolute deemphasis on test prep, which used to be central to the approach in the previous administration. We do not believe in a focus on test prep, we believe in teaching and doing what we think is best for the educational development of students, and then measuring, with not just tests, but other measures as well, to see how we’re doing with each student, and then make adjustments. And the state has certainly stepped away - the state Dept. of Education and the commissioner, Mary Ellen Elia, have done a lot to step away from an overreliance on high stakes testing. And obviously, one other point, the worst remaining example is the single test to get into the specialized high schools, which I would like abolished, and I’m going to work to do that. So I understand where parents’ feelings and honest concerns come from, but I want to emphasize that a lot has changed, and testing as one of multiple measures still helps us to figure out what we need to do to help each student, and I think people should participate for that reason. BL: According to the numbers in the New York Times, the epicenter of opting out is your home neighborhood of Park Slope, where 35% of the kids at PS 321 sat them out last year, compared to just 3% citywide. What’s going on in your neighborhood? Is it a class thing, and what would you say to your neighbors? MAYOR: Look, I think it’s understandable— and probably is more of a specific political thing than anything— I think it’s understandable that people who opposed what was going on for many years in this city and this state and this country, and certainly, people who I agreed with on so many levels, including in opposition to the approaches in No Child Left Behind under George Bush, that they would want to continue to act on those concerns. I’ve met with parent groups, I understand the underlying concerns. My argument is a lot has changed. And I get why sometimes people are skeptical or are not seeing all the changes because they’re focused on some of the problems they were originally confronting, but I would ask that people look carefully at what we’ve done here, and how much we’ve de-emphasized high stakes testing, and we will continue to do that. And especially how much we’ve gotten away from test prep. One of the worst parts of the Bloomberg-Klein years was the incessant focus on test prep, which really undermined our kids’ ability to learn and our teachers’ ability to teach. We’ve moved away from that, we don’t believe in that. So, I would just ask that people look at the consistent changes that have been made, look at the values of Chancellor Carranza, who absolutely does not want to see a focus on high stakes testing-- only believes testing is one of many measure we use toevaluate and to act. And I think if people looked carefully, they would take comfort that a lot has changed.